EVERY WEEK I take £5 to Ridley Road market in Dalston, London, to spend on seasonal food, then tell you what I have chosen, and on Friday I publish a seasonal recipe and perhaps a few suggestions. Some of the recipes will be frugal. They will all be tasty. Some meals will need additional ingredients. All will be vegetarian. Do not be put off making pastry. It’s easy and does not take long. The quantities listed made enough pastry to cover my frying pan. Set oven to 220C. Wash all vegetables. Place flour and fats into the mixing bowl and rub together forming a breadcrumb mixture. About 5 minutes. Add the water a little at a time to bring the mixture together. It must be smooth but not sticky. Place the pastry in the fridge to rest. Heat the pan, not too much, add the oil and put in the garlic, chilli and leek or onion. Fry gently for 5 or 6 minutes, ie, until they are soft but are keeping their shape. Then add the tomatoes, whole, in a circle starting from the outer edge and working to the middle. Cook for 5 minutes, adding herbs of choice. I used basil. While that is cooking, remove the pastry from the fridge. Roll into a round to fit as a lid over the frying pan. Take the pan from the heat and brush the sides with a little oil. Place the pastry cover over the mixture and gently press down around the edge to seal. Place in the hot oven for 10 minutes then reduce oven temperature to 180C and cook for another 10 to 15 minutes until the pastry is golden. Remove the pan from the oven and place an inverted plate over the top. Carefully tip the pan upside down, holding the plate in place. Tricky but not difficult. 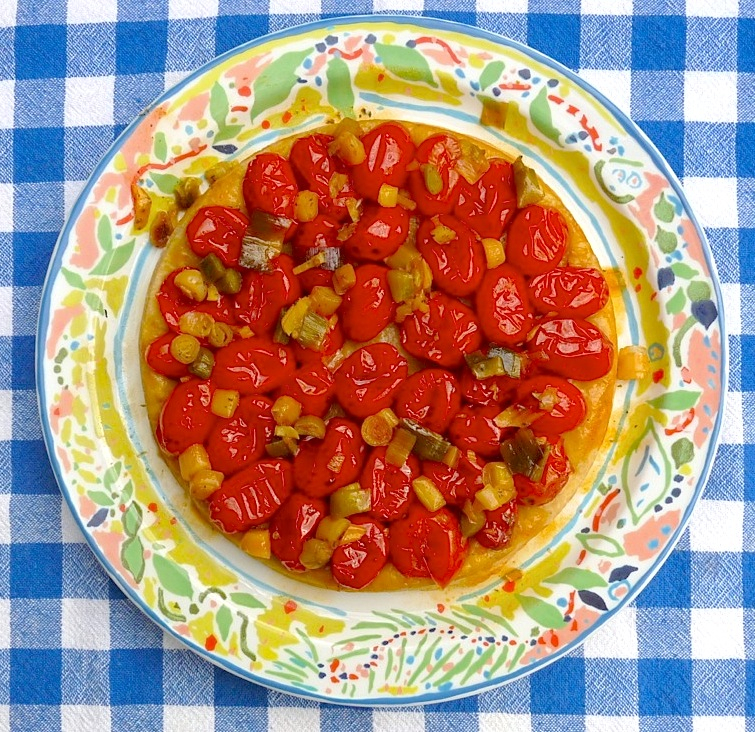 Remove pan and you have a lovely upside-down tomato tart. Place sliced aubergine on plate and mix all the other ingredients together and pour over the aubergine slices. Leave to marinate for 15 minutes, then turn each slice to soak for another 15 minutes. Heat grill to hot and place each slice on a grill tray and grill for 5 or 8 minutes each side. Or until soft. I pour the marinade over the slices when I turn them over. Remove from grill tray and sprinkle with some fresh herbs, seasoning and a little oil. This side dish goes with the tomato tart. Peel mango, slice into bite-size pieces and put into a bowl. Chop chilli finely and scatter over the mango. Pour over the lime juice and sprinkle over 2 pinches of cayenne pepper and leave to infuse. I usually leave it a couple of hours and it keeps for a day. There is lots of veg left in the basket: 2 corn on the cob steamed or boiled and eaten the classic way with butter and seasoning. The third cob will have the kernels removed to use in a rice dish. The mangoes will be turned into classic mango chutney and the bananas are large, so half will be enough to add to breakfast. The aubergines will be made into a tasty dip and the leeks will replace onions in my dishes. The tomatoes will be used in salads and sauces. And the chillies, all those chillies? I shall string them up to dry, and use them in the months to come. Tip: Save the chilli seeds and dry them on a sheet of paper. I use kitchen paper towel, on a warm window sill or airing cupboard — anywhere warm. You will never have to buy chilli seeds for flavouring. In the market this week I saw flat white peaches, Turkish peppers and cabbages at 2 for £1. I ambled past. Instead, I bought foods for their colourful summer appeal. I have leftovers from last week’s basket: a butternut squash and 2 peppers. The squash will keep for several weeks but the peppers must be eaten soon. * Hyperlink for previous excursion. Press this hyperlink for “Ridley, glorious Ridley”, the story behind this column.